Summer, as we know it best, is the season of beach-tanning, fun, and travel; but more romantically, it is the season for weddings. No one, I believe, will pass on a wedding invitation this summer, because we are in Lebanon—Everyone will end up being invited to some wedding somewhere because Lebanon is such a small country and Lebanese people like to throw a big party and invite everyone. That got me thinking, why don't I share with you my styling session experience with Esposa? AUB and exams, believe me. But I’m going to make time for this now—just in time for the season! Esposa, (Facebook page here), is a couture house that provides dresses to all kind of women of all different styles. Besides Lebanon, it has a boutique in both Dubai and Sao Paulo. In Lebanon, the bride audience is divided according to the store’s location—Jounieh, Dbayeh, or Beirut in Lebanon and also, according to the brands available at each store. Esposa’s store in Jounieh starts off with the lowest prices that are less than $1.5 K. While the store in Dbayeh offers dresses within a range of $1.5-4 K, the Beirut store scores the highest prices beyond a $4 K. Note that not all dresses can be rented out and this only depends on the brand’s policy; dresses are being rented only in Jounieh and Dbayeh stores. 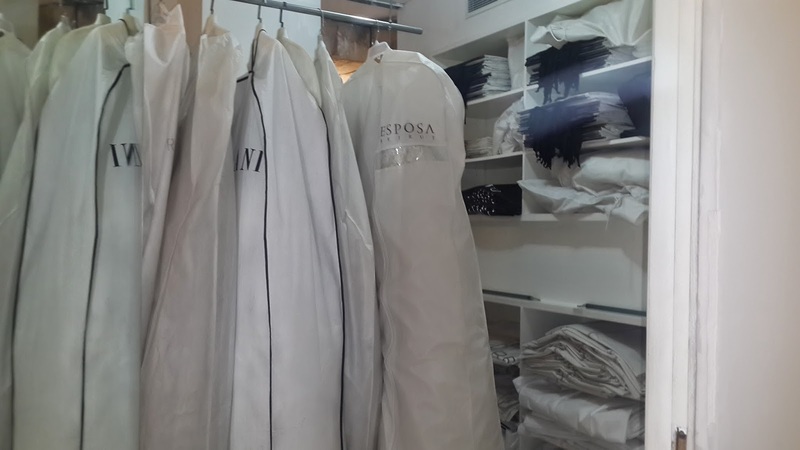 Esposa Beirut offers some of the most prestigious bridal couture houses—MARCHESA, LAZARO, VERA WANG, CAROLINA HERRERA and MONIQUE LHUILLIER among others. Esposa Beirut is a beautiful boutique that looks ridiculously small on the outside, but once you step inside, you discover the three floors boutique to be quite spacious and royal for a princess of her own dreams. And then, I also learnt a great deal about the way a wedding gets organized: the process of choosing the dress only takes about 6 to 8 months prior the scheduled wedding day, the “tiiimeeeee” Miss Princess chooses her dress and then orders it to become a Misses Prince. Ideally, the couple will fix a wedding date prior a year to be able to send notice for their family or close friends living abroad (which is very common in Lebanon so it makes sense). I was put in good hands with Mary who personally took care of me; she is the boutique’s personal stylist, (this job is such a natural fit for her). She introduced me to the boutique’s concept and made me try dreamy dresses—now I don’t hate myself anymore for forgetting every year to participate at Le Bal des Debutantes, a glamorous fundraising event for the Red Cross where participants get to dress in beautiful designer couture gowns and waltz with daddy and their dance partner. The first dress I tried is a bridal gown by LAZARO. It is a dress for the young bride that wants to have fun on her wedding day. What I liked most about this dress is the rainbow of colors piled up into layers underneath the main layer. Another thing special about this dress is the vintage style beading and embroidery on the upper strapless part of the dress. To get your hands on this dress, you must be able to spend around a $6,000 budget. The second dress I tried is a SAVINA DELUCA dress, which is definitely more conventional than the first. This dress personifies a royal look: a very low cut open back, longue tail and lace on skin which is a mixture of both Chantilly and Calais lace that deserves its justifiable $15,000 price well. There’s another thing that I like very much about this dress and it is the slight and discrete beading on the bust. Likewise, another detail that would trigger your attention is the appliquéd lace on the skirt; it pops out behind the transparency of the tulle petticoat and adds to the surface richness and beauty. The heels that I would choose to wear with it are comfortable red carpet shoes of the brand name "Aruna Seth". According to Mary, choosing the right shoes for a wedding is crucial — comfortable heels that you will have to wear for the entire day — they must be reasonably high and approximately 10 cm with a double platform ideally. The third dress I tried is an ESPOSACOUTURE dress. It has a ballooning effect much like the previous dress with the appliquéd lace on the bottom but even in a more exaggerated way that it resembles a ballerina tutu. It is definitely a dress for women who want to feel like princesses on their wedding day but in a less conventional manner compared to the previous one. It has a less poised and more electrifying attitude; however, the wedding dress is always as elegant. The price for this dress ranges between $8,000 and $9,000. The fourth dress I tried is my favorite one, and it is designed by MARCHESA. I imagined myself in a context of a wedding held on a beach or in the forest; and in my opinion this is what has added a lot of romanticism to the dress. The dress is close fitting but somehow loose at the same time; a bow belt stretches under the bust to define the waist despite the straight cut. The dress is made with both tulle and Chantilly lace and has a mini tail that would trail behind me when I walk. To add even more to the idyllic image of the dress, I wore a wreath of bejeweled silver flowers and white beads. This is my dress if I had to pick one. I would definitely pay the price for this dress, somewhere between $6,000 and $7,000.